Snuff those sniffles with a lean, high-fiber soup bowl that’s jam packed with immune strengthening nutrients. Vitamin C and beta-carotene from carrots and sweet potato give your immunological warriors a hefty boost, while ginger offers powerful antiviral protection that help to stoke your body’s infection fighting fires. 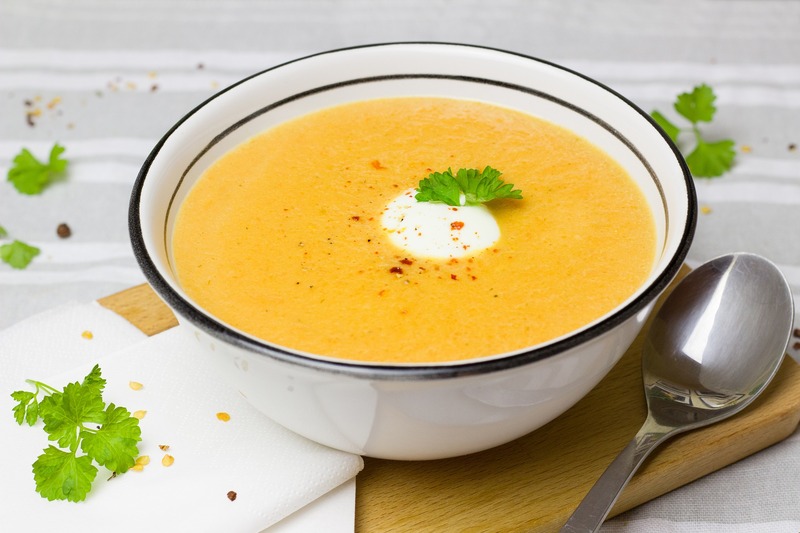 Cashews not only endow this silky soup with luscious creaminess, but are also a good source of zinc, fiber, protein and healthy fatty acids. Bring a bit of glowing sun into these dark wintry days with this vibrant, warming and incredibly delicious soup. In a stockpot, heat coconut oil on medium heat and sauté onions until they are soft, about 4 or 5 minutes. Add in the ginger and sauté for another 30 seconds, until fragrant. Add carrots and sweet potato to the pot, tossing all ingredients together for 2 more minutes. Pour in the broth to cover all of the vegetables (add more liquid if necessary). Bring liquid to a boil, and then turn down to a simmer. Continue simmering until the carrots and sweet potato are tender (about 20 or 30 minutes, depending upon how thickly the vegetables were chopped). Then remove from the heat. Allow the soup to cool, and stir in the cashew butter. Then use a hand immersion blender to purée the soup to a creamy, even consistency. Add some sea salt to taste, rewarm the soup and ladle into bowls. Going to try one of your recipes and see what its all about. thanks for the opportunity.